Then, right before Alice Springs, there was a town with an aboriginal art gallery and whose position was marked by 2 large statues. This aboriginal man is 17m tall to the tip of his spear and weighs 8 tonnes. The woman is similarly sized. Not far from there was the highest point on the highway, at a soaring 721m of elevation, after which we descended into the roaring, surprisingly large town of Alice Springs. Fun Note: In the last few days of Western Australia, I decided that I sit too much. In fact, some days, I wasn’t doing any better than when I was working full time at an office job. Many studies are beginning to show that sitting 8 hours or more a day is detrimental to one’s health. So, I decided that I should try to avoid sitting or laying down so much. It has been an interesting process, as I natively don’t stand well. I have hyperextending joints all over my body and my knees extend past vertical a full 10°. I have to focus on not locking my knees and keeping them “bent” (which for a normal person is vertical, but not locked in place). My feet have had to adapt as well (they always complain about me standing on them too much). Interestingly, many of the exercises I do for my knee have also helped my standing posture. All that to say that despite the difficulty, most days I have been able to do it. I am not necessarily more active than I was, I am just doing things standing that before I was doing sitting. For example, standing while blog posting, watching TV, etc. I don’t know that I notice much difference in myself, but I do think it has been a good thing for my knees. I guess time will tell. Turns out there is a lot in the red center to see. However, the majority of it is west and south of Alice Springs, whereas the stuff east of it is pretty even with it. 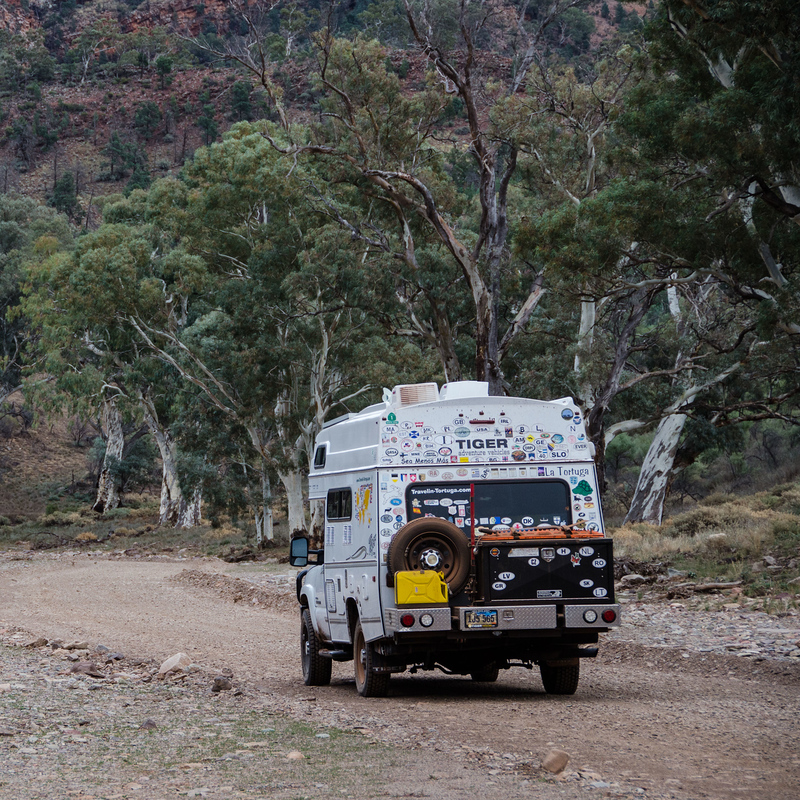 So, we decided to hit up the East MacDonnell Ranges before heading west and south. These scenic ranges are not as popular, especially since it only recently got bitumen on the highway there. Since it was getting fairly late and it was a weekend, we chose to start off at Trephina Gorge. This put us quite a distance from town (to avoid overnight drinkers) and let us work progressively westward. That next morning, though, as I cut an apple for breakfast, I managed to fling a knife on the ground and cut myself. This was a first for me. Fortunately, it didn’t really hurt, but it did bleed a lot. I put on my big-girl shoes, stuffed some padding into my shoe (the cut was right where my shoe ties) and went on our planned walks for the day. We started off with the Trephina Gorge Walk, which was very scenic that next morning. Then we received beautiful views from Panorama Walk. This is the largest ghost gum tree in Australia. It is 33 m tall and over 300 years old! Next up was the Chain of Ponds walk. It ended in a series of non-traversable ponds that would be a great waterfall in the wet season. Upon returning to the van, we were bombarded by a strong sesame-oil fragrance. 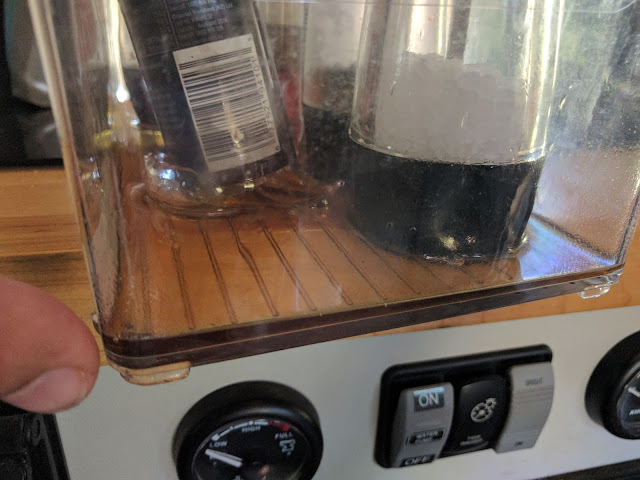 Turns out that that during the difficult 4WD trip up to the Chain of Ponds walk, the glass bottles of sesame oil and soy sauce bounced at least one time too many against each other and shattered the bottom of the sesame oil. Good thing we keep everything in these containers! 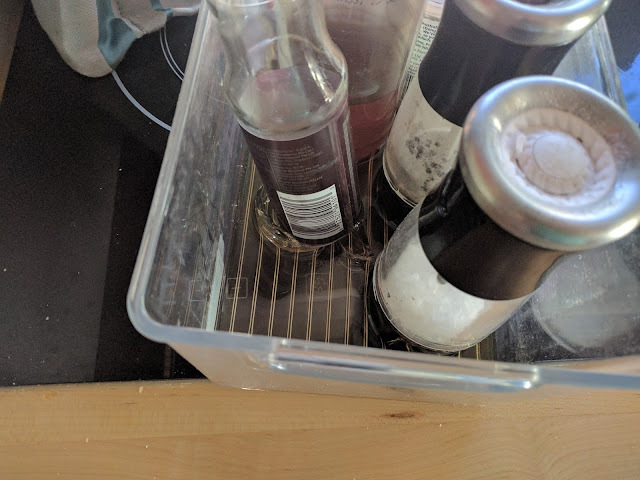 Note to self: don’t put glass containers next to each other! From Trephina Gorge, we went to N’Dhala Gorge, where we had the campground to ourselves. The walk the next morning was filled with many petroglyphs. They were located in such bizarre temporary locations (fallen rock, below the waterline). This is Corroboree Rock. What is interesting is that it is particularly long and narrow. This Port Lincoln Ringneck and its mate flitted past us at Jessie Gap. Both Emily and Jessie Gap had rock paintings similar to these. They are related to the emu and caterpillar dreaming stories. Then, we were back in Alice Springs, ready to head west and south. Personal Note: By the point we reached Trephina Gorge, my knee was feeling really good again. I had even restarted my cardio and weightlifting exercises. But then, all day at the Trephina Gorge National Park, I walked 8.2 km forgot to put on a brace or tape. I felt fine during those walks, but afterwards my knee was sore and (spoiler alert my knee still hurts several weeks later. It feels really strong, but I can’t seem to get rid of the stiffness. Better known, and more popular than the East Macs, the West Macdonnell ranges lie north and east of Uluru. They contain a number of scenic gorges (both public and private) as well as some other unique sights. Where gaps form in the ranges, watercourses erode their way through. These gaps often have permanent waterholes, a rare and vital commodity in this desert. Debris and fallen trees bear witness to the raging torrents that form when rain touches this parched land. The water draws lots of wildlife in from surrounding areas. Here a flock of zebra finches arrive for a drink. In several of these gorges Cycads can be found. These truly ancient species are relics from the age of the dinosaurs when Australia was a wet and fertile continent. Only these descendants remain, having adapted to a dryer climate. Even so they are only found in a few small ranges, thousands of kilometers apart. 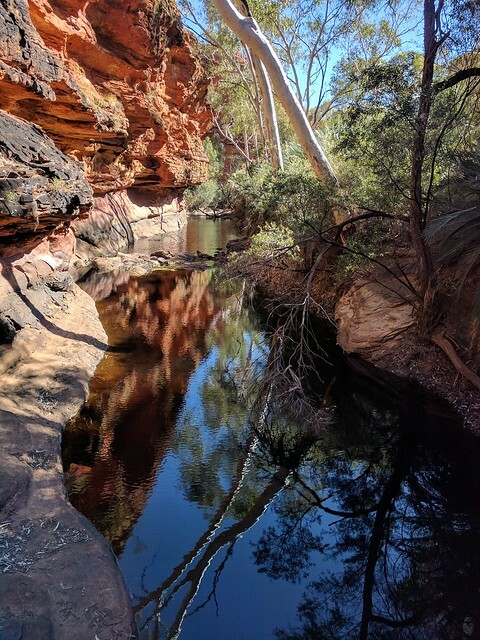 Ormiston Gorge offers several excellent walks, with great views from the gorge floor. Instead of taking the fully paved southern route from Alice Springs to Uluru, we opted for the scenic loop drive through the West Macs. This meant we would have the opportunity to visit Gosse Bluff (actually a huge comet crater) and Finke Gorge. Viewed from the distance, Gosse Bluff just appears to be an odd circular formation of hills. Viewed from the inside, you see heavily eroded rock formations, that were once nearly vertical. They ring the entire crater, which is about 5km across. Approximately 142 million years ago, a comet over 1km in diameter crashed here in what was likely a temperate forest at the time. The energy released was over a million times the atomic bombs dropped on Japan during WWII. When the dust settled, a crater over 20km, and hundreds of meters tall was left in the plain. Within that crater another small 5km crater of solid displaced (nearly vertical) rock was also present. Over time, the larger crater has eroded into a small rise, which can be noticed driving to the central crater, which is Gosse Bluff. Only the vertical and erosion resistant rock in the bluff has remained prominent. 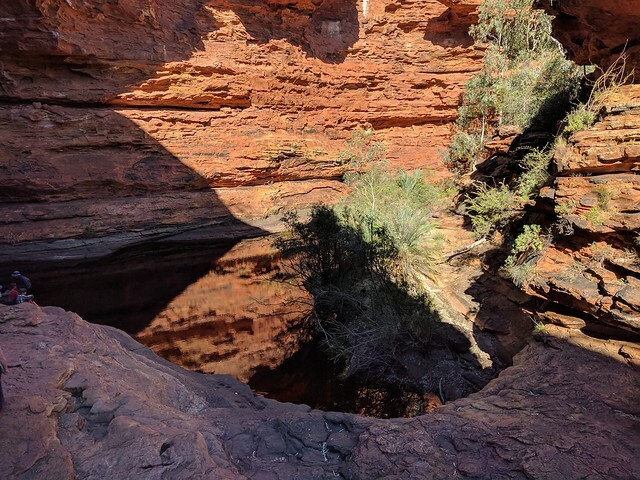 After we finished at Gosse Bluff, we continued driving south towards the end of the pavement and took a small detour eastwards to Finke Gorge. At the end of its own 20km 4x4 access track, Finke Gorge is a bit of a challenge to access. Jen's incessant desire to see unique flora and fauna set us towards this destination, only to find it was a "Severe 4WD Road." A quick conference with someone who just finished the road, gave us confidence to move forward however. On the way to the gorge, we managed to eject stuff from various cabinets on the rough track. The last 5km are basically light rock crawling at 20kph. A number of times we used the skidplate to clear rocks and debris during dry creek crossings. Here is a video of the 4 km between the campsite and the gorge. Took us 16 minutes to complete. There were also lots of brumbies (wild horses) roaming the area. One of the big draws of the gorge is a unique species of palm tree called the Red Cabbage Palm. Found only in this small reserve in central Australia, this palm is a leftover throwback to a time when central Australia was wet and green. Now it only grows in a few isolated pockets where it is protected from fire, and has permanent access to water. Here is a Cabbage Palm seedling. Notice the distinctive red color. Interestingly, this gorge is also one of the few places where Cycads can be found. These are another leftover from a bygone epoch, and are evolutionarily separate from the seed-producing plants we are all familiar with. Several of the cycads in the photo below are over 200 years old. After our exciting drive into Finke Gorge, we headed north on the roundabout track to Kings Canyon. Mostly dirt, this well-maintained road still claims its share of vehicles. Excessive speed and lack of respect for gravel/dirt are the primary causes. We passed several long-abandoned roll-overs, as well as a fresh accident involving a “Wicked” brand rental camper van. The drivers had lost control moments before, and ran into a tall embankment, disabling their rental. Thankfully, some folks had stopped to help, as there was no civilization for at least 150km and no cell service either. Like many of the other gorges in NT, Kings canyon is a big gouge eroded by water following a fault in the sandstone. Alternating layers of rock material produce different capping compounds. Some produce iron oxide layers, others grow a type of algae. These change the way they erode, producing these distinctive beehive shapes. This rock face cracked loose a few decades ago. The sandstone here is actually nearly pure white. But it contains particles of iron. When exposed to the air and rain, the iron leeches out as iron oxide, turning the surface varying shades of red. At the far end of the canyon, several permanent rock pools form an oasis, which is called the Garden of Eden. Near the water a number of Spinifex pigeons strutted about. Relying on their camouflage, these birds rarely fly, preferring to hide under a spinifex mound. Probably a good approach given the number of kestrels and peregrine falcons about. Check out that crest! 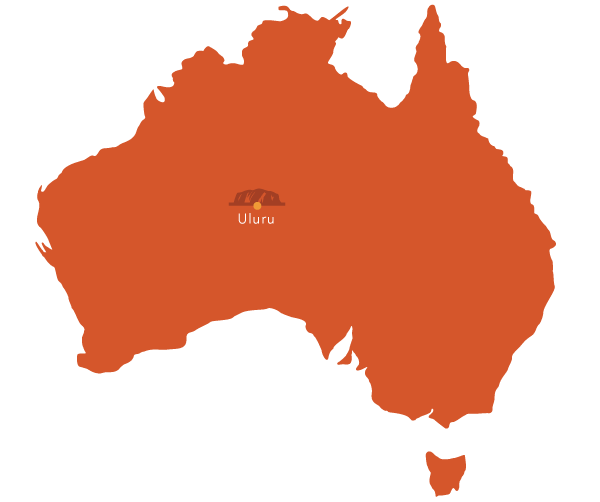 When an American thinks of Australia and what there is to see there, they most commonly think of Ayers Rock, which is more correctly named Uluru. We had finally arrived to see it after nearly 6 months (1 week short) of being here. It was about what we expected: a big rock and a tourist trap. To be fair, it is much more than that, but not nearly all it is hyped up to be. As we approached the rock from the north (at around 11am on Saturday during the school holidays), we suddenly came up on a long line of cars stuck in a traffic jam. They were of course stopped in our direction. Jonathan wanted to just pull off and get some lunch and let the line disperse, but I knew better. It would only get worse, and it did. Turns out that this congestion was caused by the fact that the park only had 2 lanes to enter it by, one of which was for people who had already obtained their passes. Unlike Kakadu, you can’t purchase your tickets ahead of time, so you are stuck going down the one lane to get a ticket. They only have 1 person working there at a time, so you can’t make the line move any quicker. Very terrible setup for one of Australia’s most popular parks. For those who are curious, the park tickets cost $25 per person for 3 days, or $32.50 for an annual pass. My plan was to simply do the long walks at each destination (Uluru and Kata Tjuta), which I figured would get us away from the crowds. 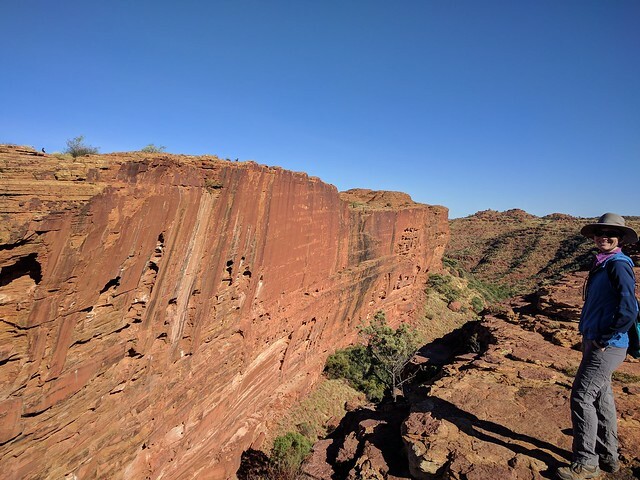 However, since it was after noon and each walk would take 3+ hours, I figured we would pick off the few short walks that weren’t covered by the larger ones, which was the Walpa Gorge at Kata Tjuta. We also checked out the view from Kata Tjuta’s dunes. Next day, we decided to do sunrise at Uluru. This and sunset are supposed to be epic. While interesting, sunrise, while less crowded, was definitely not as gorgeous as I was hoping. The main reason for this is that the main lookout is positioned south of the rock. Since we are south of the equator, the sun is always on the north side of the rock, especially at this time of year. So, we only saw a few small rays hit hit the rock, not the entire rock suffused in sunrise glory. I guess this is why sunset is more popular (lookouts are positioned on the north side of the rock), beside the fact that not many people want to get up and going before 730am in the morning, especially since you can’t camp in the park. Uluru in forefront, Kata Tjuta in background. Since we were already near Uluru, we decided to go ahead and do that 10.6 km walk around the base. This is a bit deceptive, as you only get to go near the rock on half of the circumference. The other half you are far away, but not far away enough to capture the entire rock in your photo (without panorama mode). It was a good walk though, and less busy, especially since we started early. There were quite a few people though who took advantage of the fact that you could cycle around it, which may be a better alternative to what we did. Interestingly, there were many sections of the rock that were considered “sacred” or culturally sensitive, and they didn’t want you taking pictures of that section. What I found fun about the walk was the little garden sections nestled in inside corners of the rock. You would walk from the desert plains and into a little oasis with trees and waterholes, which were made possible by the water that flows off the rock after the rains. Even while driving or walking around the rock, you don’t immediately notice these sections, so they are a bit like secret gardens. When camping nearby that night, Jonathan noticed a unique vehicle that had been all over the world and had US plates on it! We were so excited. It was the first vehicle we had seen that had also been temporarily imported under a carnet. And the 3rd group of people we had met from the States. We chatted momentarily, but it was getting dark and they needed to set up camp (plus we had dinner on the stove), so we parted ways. But, the next morning, on our way to Kata Tjuta, we stopped to talk for longer. It was really fun to talk to people who had done similar things. And, they had already visited New Zealand, so we could pick their brains about the experience. Visit Travelin-Tortuga.com for more information on their adventures! Our last walk was the Valley of the Winds (7.4 km) at Kata Tjuta. They weren’t lying; it really was windy between those conglomerate rocks! It was also beautiful. Fun Note: While traveling in Australia, I have recently learned that people have different ideas about what constitutes a good sunset or sunrise view. Growing up in flat southwest Kansas, my definition of a good sunset/rise is 1) whether the horizon is flat enough for you to see the sun appear to “grow” in size and turn orange and red in hues, and 2) whether there are clouds in the right places so that the sun can cast gorgeous colors on them. (I love it where there is that purplish pink against that dusky blue cloud!) However, most people in the outback define whether there is something pretty to cast golden rays on while it sinks. For example, in Bungle Bungles, one of the “best” sunset watching spots was up on a hill where you could watch the sun change the colors of the hill. Here in Uluru, they define it as a good spot because you can see the rocks change color. Definitely a different focus. When we were approaching Uluru a few days earlier, for a few minutes, I mistook Mount Connor as Uluru. Jonathan told me that it was massive and could be seen from a great distance, so when I saw the reddish-pink “rock”, I got excited for a bit. But, as more of it came into view, it was obvious that it was NOT Uluru. Despite that, it is a pretty mesa and was in our view from our campsite after leaving Uluru. We had tried to stay at Curtin Springs, but someone lit a fire just a few feet from our van and filled our van with smoke. I really can’t handle smoke, so we drove a bit down the road. Nice and quiet there. From there, we decided to swing up to Henbury Meteorite Craters Conservation Park. But, after all that time driving in the outback, we needed to fill up. The cheapest place south of Stuart’s Well was Erldunda Roadhouse at a whopping $1.749/liter. When we arrived, there was a long line of cars, so we settled in for the long wait. Fortunately, Henbury was worth it. There were 12 craters, but only 5 of them are really noticeable. A lovely sunset at the park. As noted previously, to get to Uluru, we had to drive halfway down the middle of Australia. Since we were so far south, we had several options on what we could do from there. We could retrace our steps back north and head to Queensland that way. Or, we could head south and knock a few things off the list that we didn’t do the first time around. As I am diametrically opposed to going back the same route when we have limited time to see the country, I suggested we pick up Coober Pedy as well, then head back North via a different route. So on southwards we went. We quickly crossed over into South Australia, then made our way to the Painted Desert. We knew we were getting close to Coober Pedy when there was a sign saying that there were unmarked holes all over and there were mounds of mine tailings everywhere. Coober Pedy is known for its opal mines. As always, the prospect of mining and making a fortune draws people from all over. Coober Pedy was located in the middle of nowhere Australia, though, with little to no electricity or roads, etc. It is also HOT. Even now, in their winter, you don’t need long sleeves. Even nights don’t get too cold. So, people started building their homes underground to beat the heat. Here are some interesting statistics from our journey in Australia’s non-state. Does NOT participates in DST. The large area (twice as big as Texas) that would be Australia’s 3rd largest state (if it was a state) houses only 200,000 people. Darwin itself has a population of 127,500, so that leaves only 72,500 people to populate the rest of the state, and the majority of those are in its Top End near Darwin. About 50% of all this land is owned by the Aboriginals, which consist of 30% of the population. NT’s campsite fees are normally really inexpensive. $3.30pp for sites with toilets only; $6.60pp for sites with showers.